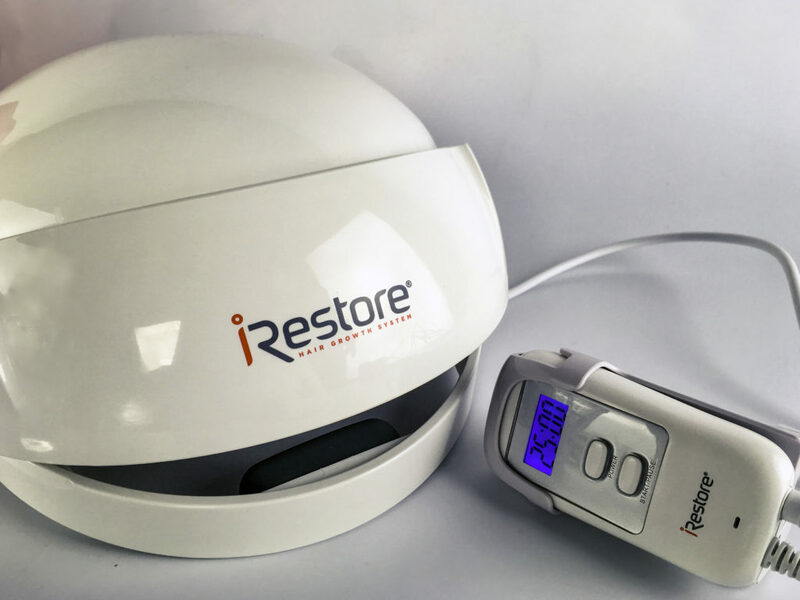 Welcome to our update of the iRestore Hair Growth System for Month 5! 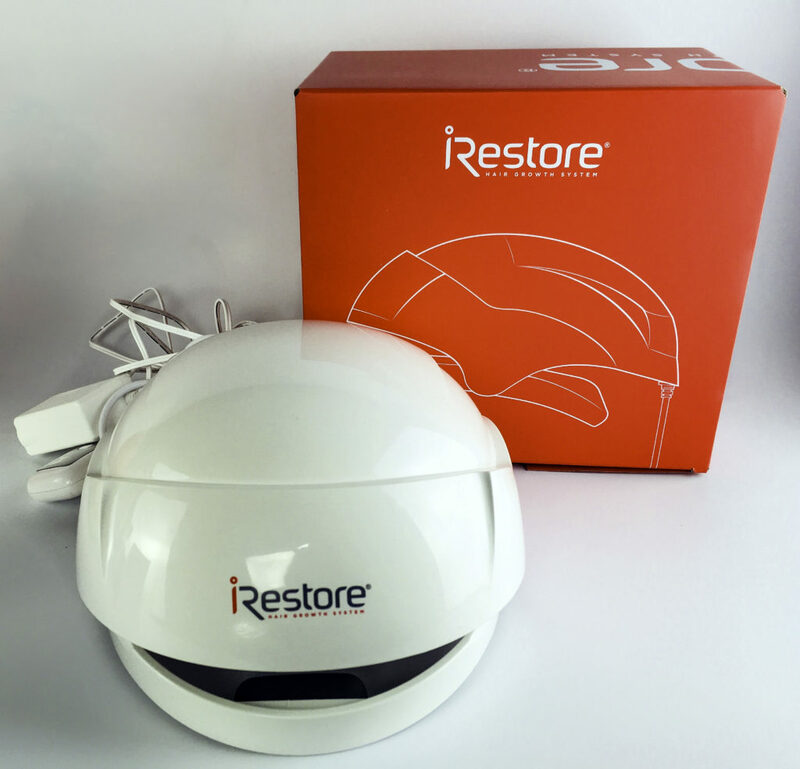 I have continued to experience some new growth with the use of iRestore Hair Growth System. The new hair I reported last time has grown to over an inch. The hairs appear to be the same thickness as other healthy hairs on my head, which are thick and coarse. I now vary the part each time I use iRestore ID-500 Laser Dome but it is too soon to expect a response to this new approach. Since I need to color my hair at this time it is easier to identify the new hairs, which are white, my natural color, and it is obvious that I’m getting results! Learn more about the hair growth cycle here. While I have no new hairs in the spots that I have hair loss, I noticed something interesting: I have a few grey hairs popping up here and there. They are always short and wiry in their growth cycle. The other day I noticed that I was able to tuck the greys behind my ear, and that they were fairly silky. My guess is that these hairs are benefiting from the iRestore Hair Growth System. 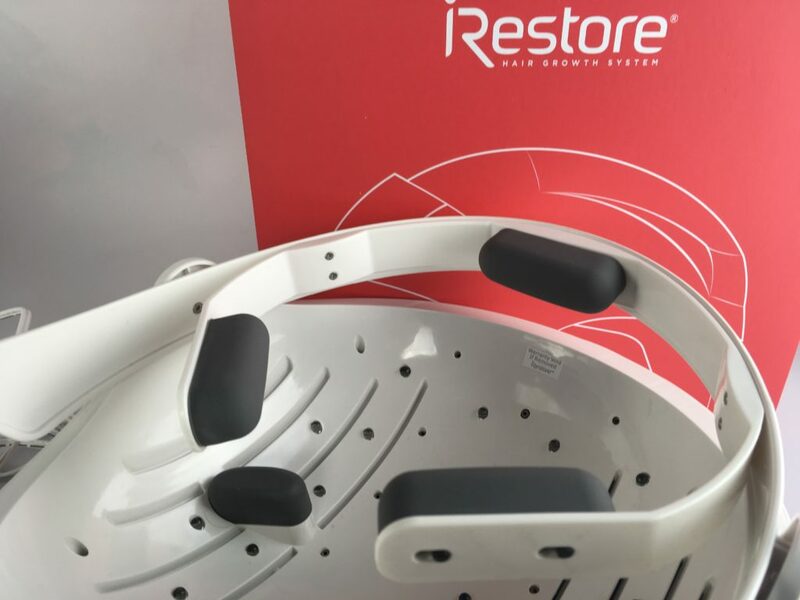 Even if these hairs weren’t affected by hair loss, the iRestore Hair Growth System has had a beneficial effect on the length of the growth cycle as well as the texture of the hair. Nice! I love knowing that the iRestore Anti-Hair Loss Shampoo is keeping DHT off my scalp! The shampoo continues to keep my hair in good condition. I try to alternate off shampoos, but I can consistently use iRestore Anti-Hair Loss Shampoo without my hair getting dull. As Courtney mentioned, using the iRestore Laser Device is really easy and fits into my schedule. But my favorite part is the iRestore Anti-Hair Loss Serum: applying this serum to my scalp is a luxurious experience and I feel that it is making my hair stronger as it grows out. I haven’t noticed any new hair growth, but it does feel stronger. That’s it for Month Five! Stayed tuned for our Month 6 Update! Want to grow longer, fuller hair, but basic Biotin supplements aren’t doing enough? Biotin alone can’t address all hair growth factors. 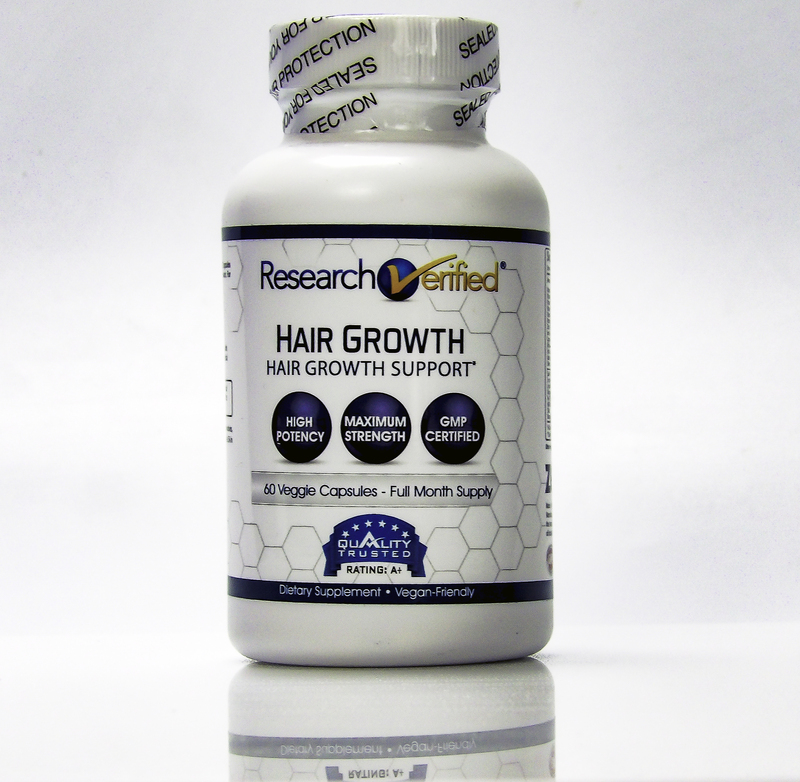 Try a hair growth supplement with natural ingredients clinically proven to address the many reasons hair won’t grow. 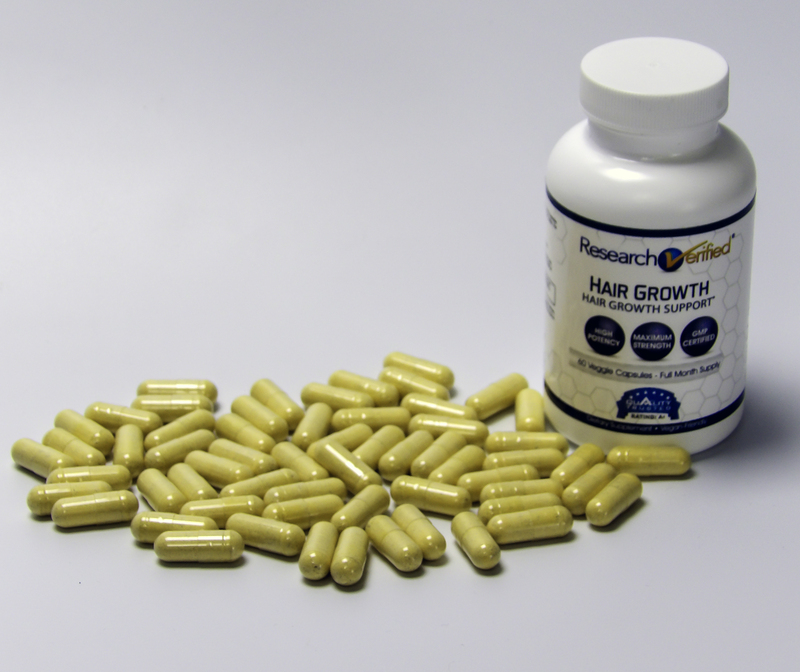 HAVE HAIR GROWTH SUPPLEMENTS FAILED YOU BEFORE? Taking prenatal vitamins have been a model’s secret for growing hair for years. Some people have marvelous hair growth results just with a basic B Vitamin supplement that includes B7, better known as Biotin. Biotin is great for hair growth, as it builds the necessary keratin protein that makes up hair. It also accelerates the hair production process, making it work overtime. If your follicles have the ingredients to make hair, they likely grow hair faster and stronger. But for some people, Keratin is not the only thing preventing their hair growth goals, as many issues can impact hair growth, hair shedding, and hair breakage. Some issues include the health of the scalp, nutritional deficiencies, hormonal changes, age, medications, and general health factors. A combination of these factors is also likely for many of us. In these cases, Biotin alone won’t overcome these hair growth barriers. If you have tried hair vitamins in the past without meaningful success, consider a formulation that addresses the many possible barriers to improved hair growth. This is where Verified Research Hair Growth comes in. Growing new hair is only half the battle. Many problems result in hair breakage and even hair loss. Addressing these include improving scalp circulation to stimulate new hair growth, strengthening dormant hair follicles and reducing follicle blocking hormones that can decrease hair loss, as well as addressing vitamin deficiencies impacting hair. Iron and zinc deficiencies, for example, are very common, especially if one doesn’t eat much red meat. They can lead to hair loss, dullness and even breakage. But some other deficiencies are common but not addressed by a simple multi-vitamin or most hair supplements. INGREDIENTS: WHAT VITAMINS & MINERALS ARE NEEDED FOR GUARANTEED HAIR GROWTH? 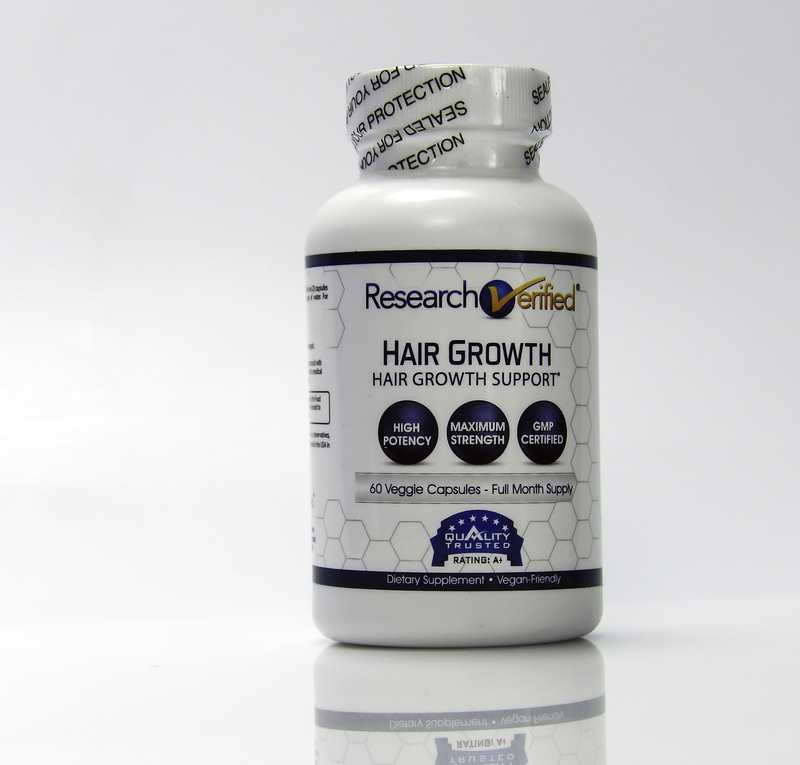 Research Verified Hair Growth supplements provide a dual-action response by both stopping hair loss and stimulating new hair growth. It contains 21 clinically proven, 100% natural ingredients including biotin, folic acid, saw palmetto, ginkgo biloba, and tocopheryl acetate, a potent form of Vitamin E. Here is each major ingredient and what it is proven to do for hair growth. Saw Palmetto is a very important ingredient that is missing from many hair growth supplements. It stops hair loss caused by DHT, a hormone that causes hair follicles to shrink, eventually choking out new hair growth until the follicle doesn’t grow hair at all. Ginkgo Biloba increases blood flow to the scalp and can accelerate hair growth rates. Better blood flow means more nutrients get to the hair production process. Fo Ti is a Chinese herb known as an anti-oxidant that stops hair loss. Tocopheryl Acetate is the most potent form of Vitamin E.
Borage Oil is for scalp health, it reduces inflammation. It is a “good” fat that contributes towards lush hair. Silica builds connective tissue and collagen that helps makes hair. We typically don’t get enough Silica in our diet to contribute to hair growth. MSM (Methylsulfonylmethane) is a sulfur compound trace and trace mineral found naturally in the body. It’s vital to make and bind both keratin and collagen and keeps hair from becoming brittle and thin. An MSM deficiency shortens the hair growth phase. MSM is commonly used for alopecia. L-Cysteine is necessary to build Keratin, and hair is 14% cysteine. L-Methionine is for hair structure and strength. Strong hair prevents breakage and thinning mid-length. Biotin is found in many hair growth supplements because it builds keratin, the foundation of hair growth. The B Vitamins work in together to support B processes that impact hair growth including signaling the body to grow hair and Keratin production. They help the body process iron which is vital for hair health. Vitamin A keeps the scalp moist by producing healthy sebum, which keeps hair from drying out and breaking off. It also facilitates the hair growth phase. Too little or too much vitamin A can cause hair loss. Proper dosage is necessary. Iron is necessary for the growth and repair of cells that stimulate hair growth. A lack of iron can lead to hair loss, dullness and breakage. Many women are iron deficient. Iodine deficiency prevents hair follicles from regenerating. Iodine also fights infections that can occur around hair follicles, damaging hair growth. Finally, Iodine helps regulate the thyroid. When the thyroid lacks iodine, hair becomes dry and rough, prematurely gray, losses volume and can even fall out, leading to bald spots. Copper increases the size of shrunken hair follicles, stops thinning and premature graying. That list certainly hits the bases, doesn’t it? 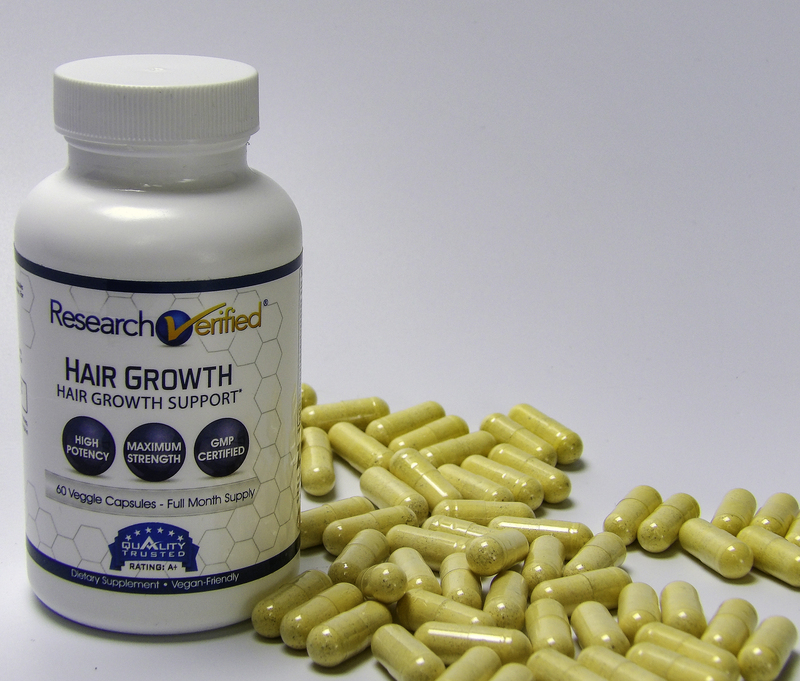 Each vitamin and mineral cited has been verified in numerous independent clinical studies documenting results in increased hair growth, improved scalp health, improvements in hair density, decreased dryness, brittleness, and breakage, or preventing hair shedding. Something else I like about Verified Research Hair Growth is it doesn’t overdo the dosage on minerals that having TOO much can harm you, or that taking too much is not harmful but just pointlessly excessive. The amounts included are what is safe and necessary for maximum benefit. 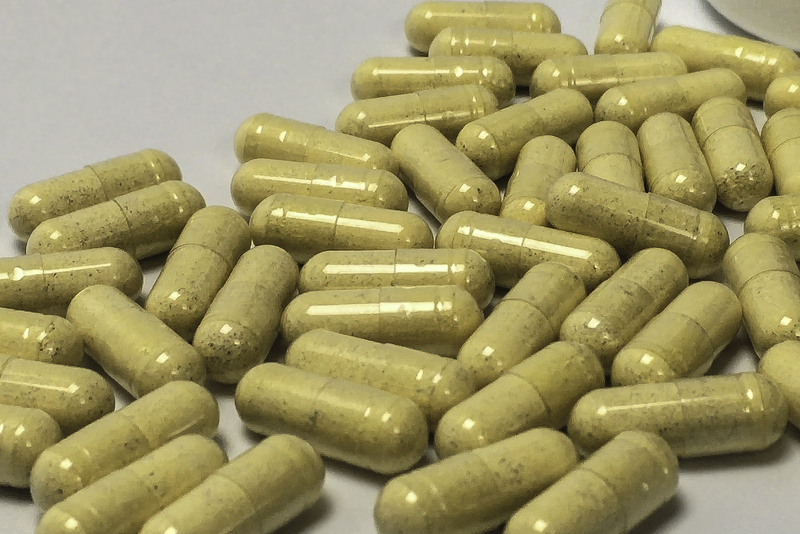 Take two veggie capsule supplements daily. Each bottle contains enough or 30 days. The soft capsules are easy to swallow. There is no bitter aftertaste. How long it takes to see results depends on the problem one needs to address. If follicles have gone dormant they can be revived, but that takes longer to accomplish than just a basic deficiency being addressed. I noticed improved nail growth and strength quickly. The quality Vitamin E not only has resulted in a healthier scalp but overall improved skin. The Vitamin E/Biotin combo is important in hair growth, so the quality of the ingredients in this supplement is important to me. Independently tested by a third party for purity, quality, and freshness, Research Verified is manufactured in the USA in an FDA registered, GMP-certified laboratory. Verified Research offers 3-month and 6-month discount packs and a 1 year, no questions asked money back guarantee, even on open bottles. 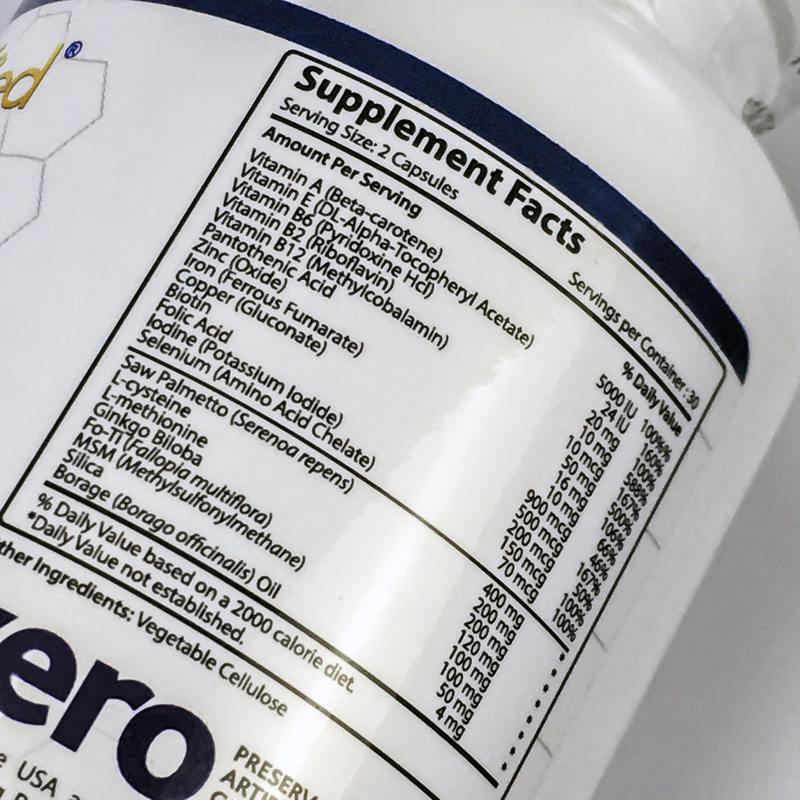 The Mommy Authority blog goes into detail about why the ingredients in Research Verified Hair Growth supplements are effective and safe for Mom’s experiencing post-partum hair-loss. Don’t abandon all hair supplements just because an incomplete one may have failed you. Your hair can improve in quality, quantity, and length by addressing the collective factors impacting your hair growth and retention. 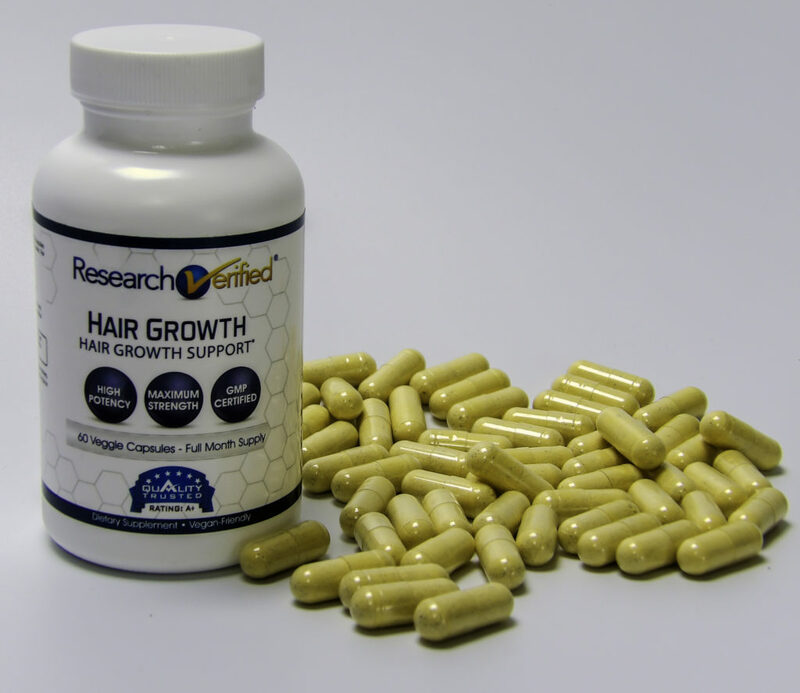 Research Verified Hair Growth Supplements contains safe dosages of twenty-one clinically proven all natural vitamins and minerals related to hair health. Two easy to swallow veggie capsules a day reverse hair loss issues and return hair to its’ ability to grow longer and stronger. Like you, the team here at Style Chicks needs time to evaluate and form an opinion of any of the products we talk about. In the case of Research Verified Hair Growth supplements, we received compensation for our time and effort to test, research and form the opinion above. Our review and pictures are because we think the product is great and want to share it with you! Do you cringe at old pictures of women bent over an ironing board, ironing their hair with a clothes iron? Modern flat irons can still do major damage. Flat ironing depletes hair moisture and protein, and weakens the hair cuticle, and can burn or break hair. Even with a thermal styling protective product, flat ironing takes a toll. Keeping hair in optimal shape requires limiting the damage that can be done by flat iron use. 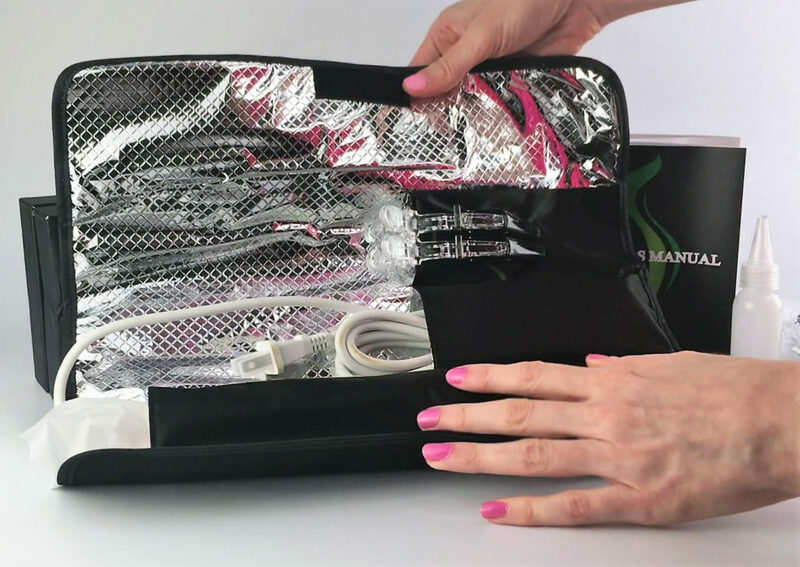 So we were excited to find the Megainvo Steam Nano Titanium Ceramic Tourmaline Flat Iron that styles while actually leaving hair in better condition, sealing in hair moisture and protein while never over-heating the hair. Hair-friendly styling using infrared heat, ceramic tourmaline, and steam. WIDE PLATE: It has a 2-inch wide plate for faster styling of long hair. Quad Core PTC Heater will not overheat, burn hair or cause a fire hazard. Sturdy construction including an 8-foot long 360-degree swivel cord. 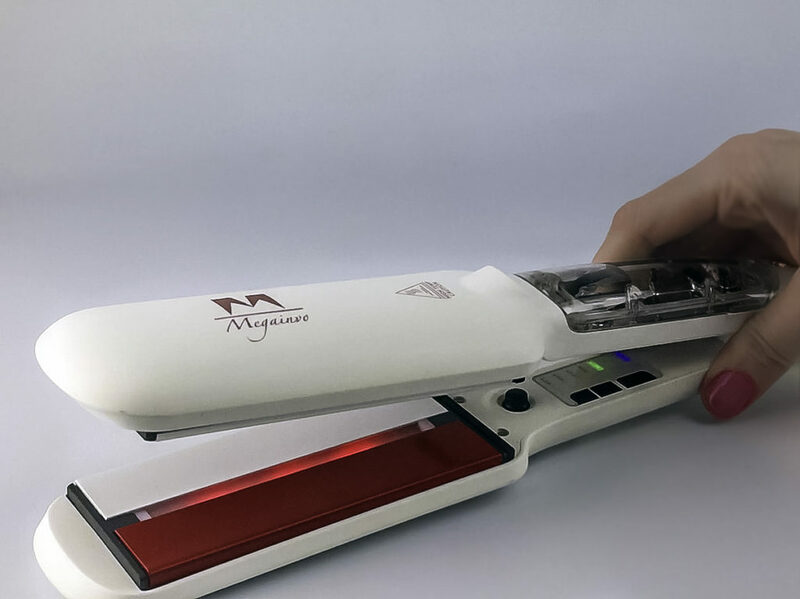 Megainvo Hair Straightener uses three main concepts to create healthy hair styling without damage: Infrared Heat, Steam, and Ceramic Tourmaline. The result is healthy hairstyles achieved with less heat. This means less hair damage, loss, splitting, and breakage without compromising style. 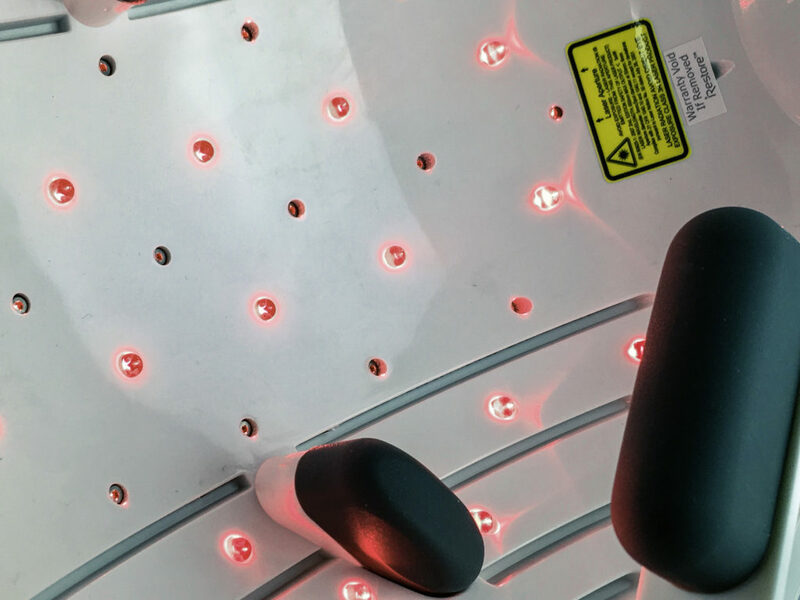 Infrared heat is ideal for hair styling because while the plates themselves are of a higher temperature, it uses electromagnetic properties to transfer and apply lower temperatures of heat onto the hair itself. This results in less damage to the protein cortex of the hair and less moisture loss. Less damage to the protein means far less hair thinning and breakage even with regular use. The infrared heat is combined with Nano Titanium Ceramic Tourmaline plates. This makes the perfect pairing because ceramic conducts heat evenly, so there are no unexpected scorch or burn marks. Has a clothing iron ever damaged a silk blouse or delicate fabric with a burn mark? This is due to an uneven application of heat. The same thing can happen to your hair, but the burn is not always immediately obvious. Ceramic prevents uneven heat or hot spots on the plate, greatly reducing the risk of burning your hair. This also means achieving the desired style with fewer passes of the tool. Tourmaline also is useful in hair styling because naturally releases negative ions. Negative ions are why ocean air smells so invigorating, they cleanse the air. Tourmaline’s natural negative ion production also contributes to shiny and soft hair. Negative ions increase oxygen absorption, reducing static electricity, friction, and frizzy hair. These factors make for easier to style hair. The upper ceramic tourmaline plate is designed to release steam via several small steam vents. This creates long-lasting hairstyles and replenishes moisture deep into the hair fiber. Steam styling maintains the delicate moisture to protein ratio that makes hair look its’ best. 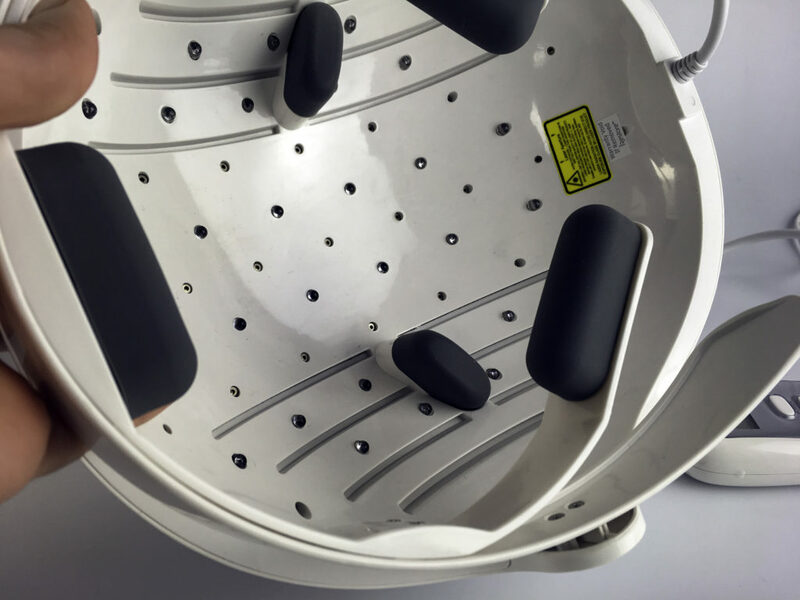 The extra moisture is a protection against the high-temperature heat of the iron. Additionally, steam helps smooth coarse or damaged hair, creating a long-lasting, sleeker look with less heat. This means even coarse hair can be styled at lower temperatures. Adjust the steam knob for more or less steam. My hair is coarse and frizzy texture if left unstyled, and I do like to wear it as sleek and smooth as possible for work. For more casual hair days I like some soft, loose curls or a Kate Middleton straight through the lengths but curled for the last few inches. With some practice, I could do all three of these styles with the Megainvo Flat Iron. 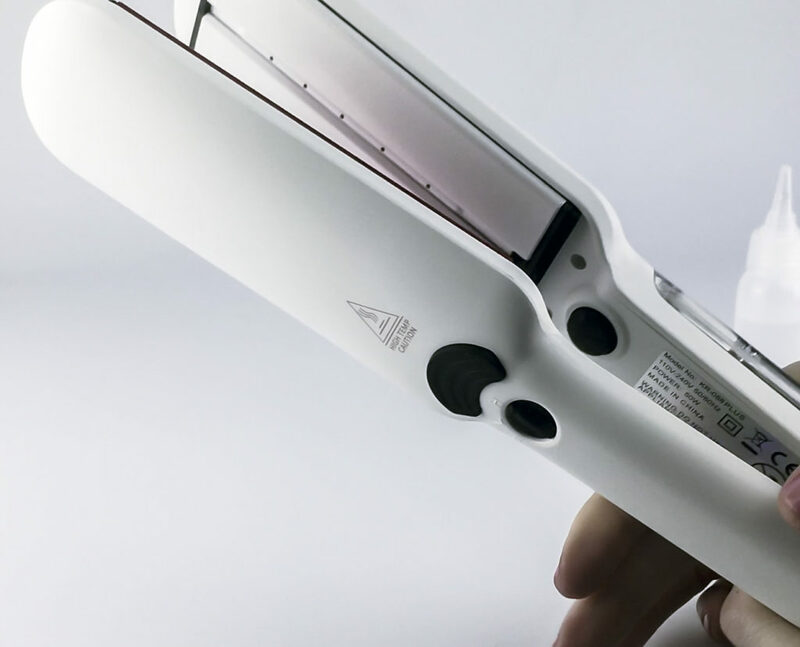 The Megainvo Flat Iron heats up in under three minutes. The lowest temperature that you can style with is always the least damaging. 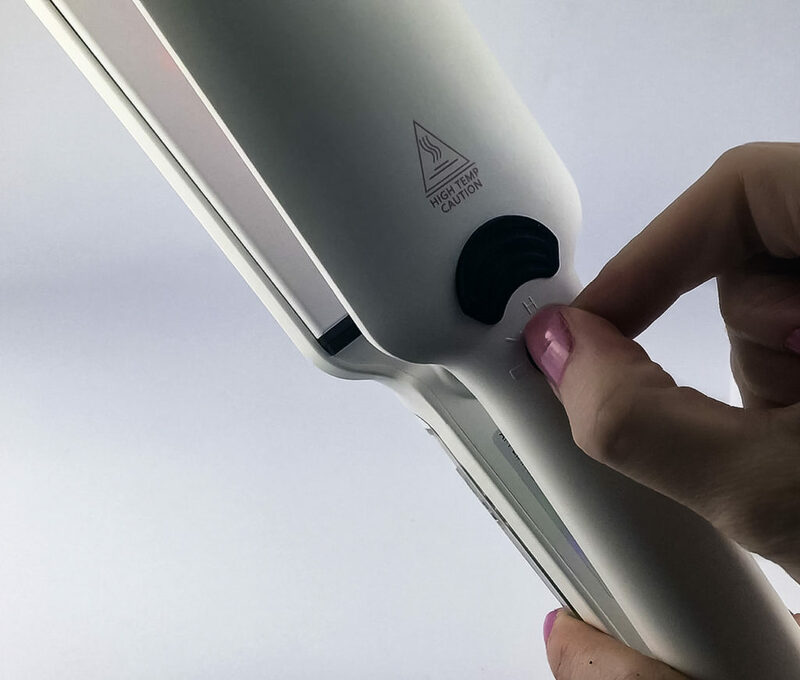 I find the infrared heat and steam combo allows me to get first-rate results at lower temperatures than I might use with other flat irons. The 8-foot long cord swivels 360 degrees which makes it much easier to maneuver, especially when creating curls. The included protective glove is useful as is the included carrying case. The only real learning curve to this iron is how to use the steam feature. To do this, the water chamber must be filled before use. This is easy to do: it snaps off after pressing the release button, there is a small hole in the back to fill it with water. Put the rubber plug back in place and snap it back onto the device. Once the device is turned on, turn the steam knob and follow the instructions while it heats up. That’s it. Select the temperature most suited for your hair type. 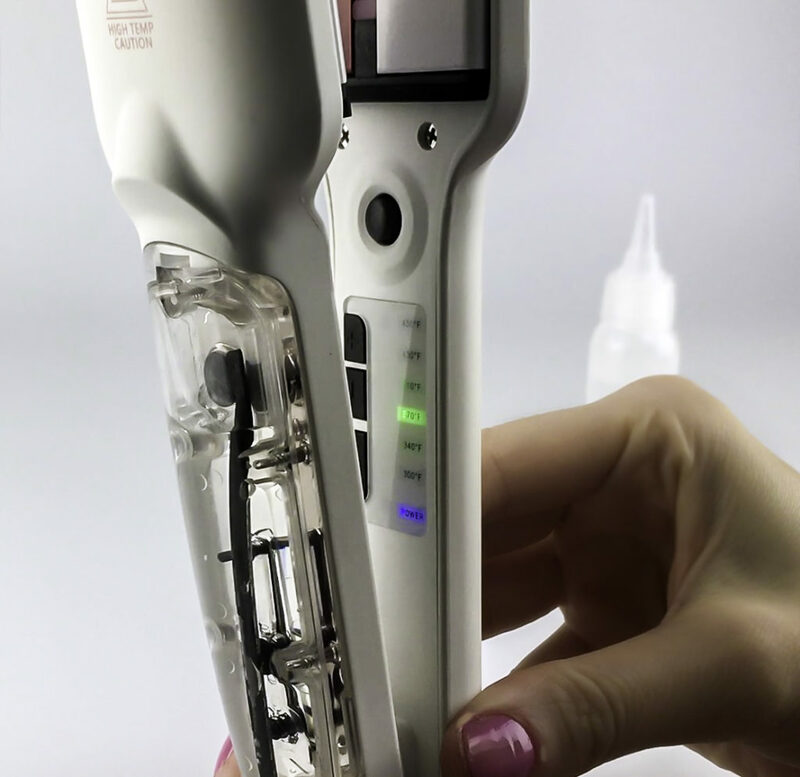 The temperature ranges from 300 – 450 degrees F.
Fill the water chamber bu using the included nozzle bottle, snap it back into place, lock it and you are ready to style with steam! There are detailed instructions included in the enclosed manual on how to use the iron to get straight and curled hair, both inward facing curls and outward. I find that using this iron not only leaves hair in good condition, but straightened styling holds well for the second day so I don’t have to use the flat iron daily. If my hair gets damp or it is a very humid day, I might do a very quick pass over the top layer of my hair and the ends and it looks as good as first-day styling. I was concerned that the steam feature would leave hair too wet and take longer to style, frizzy, or that it would make my styling products sticky and dull. But the steam is just the right amount. I find myself using less styling product because the steam does lock in a soft, shiny style on its’ own. The two-inch wide plate makes quick work of straightening or curling my long hair. 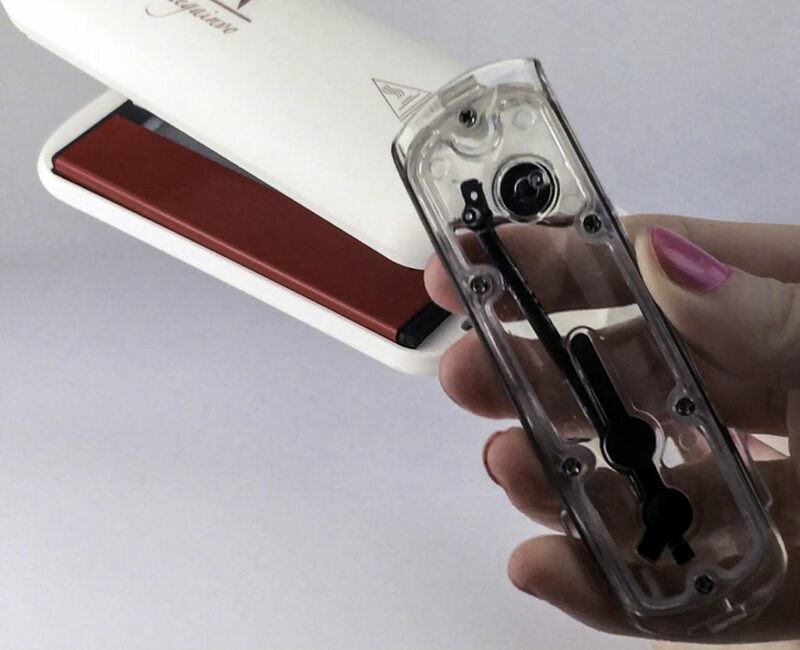 This month, we are recommending several ways to keep hair in optimal condition, and the Megainvo Flat Iron is one of them. If you are going to flat iron or curl hair, using an iron that actually helps hair stay moisturized goes a long way towards keeping hair healthy. The Megainvo Flat Iron is a high-quality, versatile, well-constructed styling tool that is easy to use and delivers long-lasting results. It is effective enough to work even on coarse hair but gentle enough for damaged or fine hair. The auto-shutoff feature gives me peace of mind on mornings that I leave the house in a rush and can’t remember if I unplugged my styling tools. Don’t risk damage to hair when you can achieve straight or curly styles with the safe, hair friendly Megainvo Flat Iron. 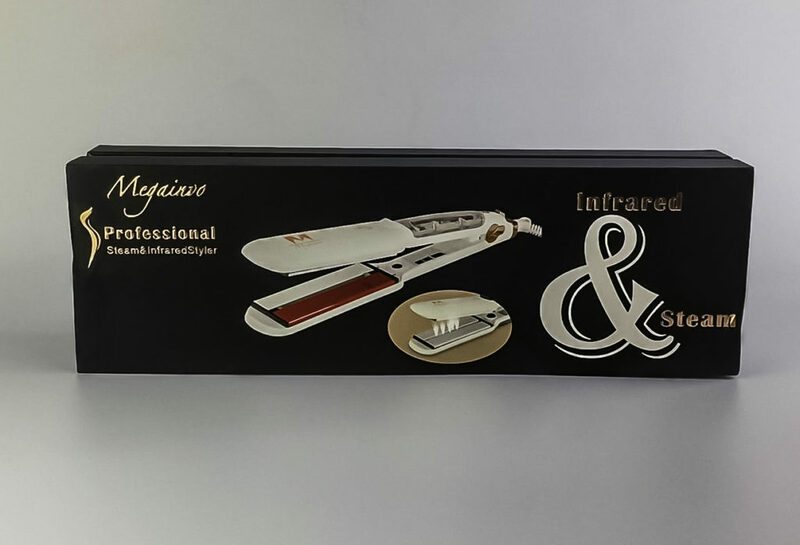 Style Chicks received the Megainvo Flat Iron Steam Nano Titanium Ceramic Tourmaline Flat Iron for review purposes and received compensation for our time and effort. However, our experience with the product and the opinions expressed in this review are 100% ours. 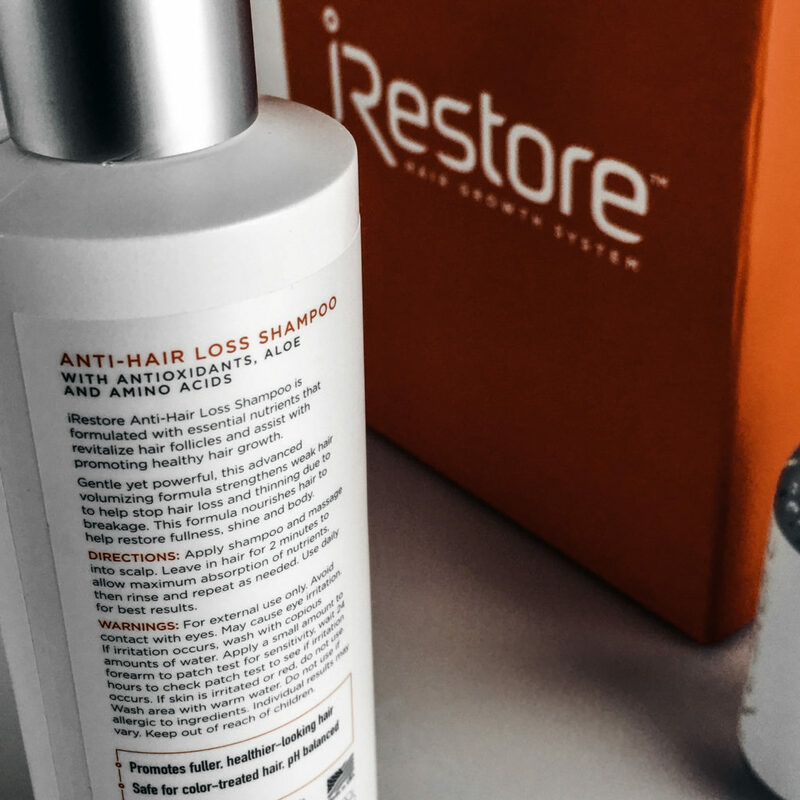 August is National Hair Loss Awareness Month, and we are proud to continue our series on the iRestore Hair Growth System. Read on for our experience with the system in our second month of testing. Two months down, four to six months to go until new growth and I’m starting to get excited! The program is now routine for me. I have a schedule of the days I use the helmet, and the supplements, serum, and shampoo are all part of my daily routine now. It seems like I’ve had less hair coming out in my brush lately. If that continues, I will definitely attribute that to the iRestore Hair Growth System. Two months in, and using the laser helmet device is still as easy as could be. I set a reminder on my phone for the days I’m going to use it, and then I use it while I’m responding to my morning emails. It turns off automatically, and I put it back on my desk for the next time I use it. What could be easier? I love the supplement and went from taking one pill to the recommended two. I started getting a cystic acne breakout after a week of taking the two tablets and initially couldn’t figure out why. Then I realized that I had been eating an especially Biotin-rich diet that week (Salmon, Sweet Potatoes, Avocados, etc), and I added the second tablet. Some people break out when they have too much Biotin in their system, and I think that is what happened to me. So, once this acne flare-up clears, I’m going to start taking the one tablet a day again and see what happens. I really hope I can start using the recommended dosage again though – apart from anything it might do for hair, my nails have gotten so strong! As I reported last month, the Serum is a delight to use, and it is a lovely ritual to massage it into my scalp. I have noticed that some short hairs in the front seem a little thicker and definitely softer, so I think the Serum may be benefiting that area. I’m especially impressed with the shampoo in this crazy heat we’ve been experiencing. It washes hair clean even after a 90-degree day when my styling products seem impossible to remove, but the iRestore Shampoo removes them gently and thoroughly. It’s great knowing that I’m going to bed with a DHT-free scalp and gently washed tresses! I’m not seeing any new hair growth yet, but it is still early. I’m still experiencing hair shedding and am having to style around it. Shedding is normal in the first few months and is possibly due to varying hair cycles, so hopefully, it will stop soon and I’ll start getting some hair growth! I colored my hair a shade darker this month, so I’m really motivated to keep up with the iRestore Hair Growth System so the areas of hair loss that I have aren’t as obvious in contrast to my darker hair color. Helmet Use: The helmet is the easy part, just schedule it for a time that I’ll be otherwise occupied and it is over in no time! I’m finding the battery pack really handy for times that I’m not sitting in one place. Serum: Like Courtney, I think the little wispy hairs in front are looking a little thicker. It’s not new growth, but I do think it is because of the serum, so I’m happy! Supplement: Love it! Hopefully, I’ll start seeing some regrowth soon, but in the meantime, my nails are growing like crazy and are really strong. Shampoo: I was really worried that the shampoo (really, any shampoo) would fade my new color, but my worries were unfounded! No abnormal fading of color, and it adds a boost of shine to my hair. Pretty good for a shampoo that removes DHT from the scalp!